Greetings to you my wonderful and regular blog reader. I must say that I really appreciate your regular visit to my website. My God will continue to Bless and Protect you. Recently I decided to redesign my blog to look responsive, Premium, good looking, charming and attractive. I was able to achieve that, although it cost me to achieve what I want. What is my greatest happy? That i was able to get exactly what I want. Today, I have decided to put same Happiness to your face. Save yourself the stress of redesigning a default blogger template or downloading anyhow new template and start to redesign it. Let me get it done for you. Ogbongeblog template is a good SEO template. What are the Features you will get in Your Website Using Ogbongeblog Template? This is how your blog/website will look, after I finished the setup for you. 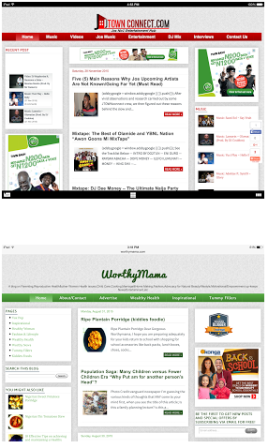 With a Left and Right Sidebar, in different colours of your choice, as seen below. What did I need from you to do this Job for you or How Much will it Cost You? It will cost you just N8,000 ( $20 ). You can pay for it online, via western union or by direct bank deposit. Click here to contact me or use the comment box below to contact me. ==> Once I finished setting up your blog, and you notice there are some features on my blog that are not on yours; let me know, I will fix that for you for FREE. ==> I will definitely keep record of the email address and blog URL you submit after purchase as they will be required for the FREE edits. ==> You will have some Commission by referring bloggers to get this design from me. Just Mail me at chukwuemekaelekanachi@gmail.com if interested. I assure you that all Blogger tweaks and tips will work perfectly using this template. I know you've got questions to ask, please relay them via comments box below.